Finally the show is slowly disappearing, although we're still freezing, but that means we can definitely put away the snow boots and not suffocate our feet into layers of socks. Today's shoe of the day is another stylish, "shearling" bootie. 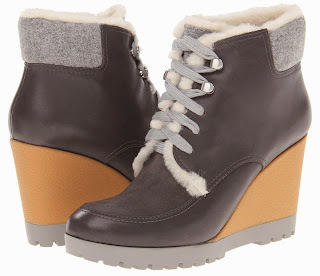 The Cole Haan Henson Wedge Bootie is the perfect fusion of sporty and fashionable; featuring a waterproof leather upper and suede vamp with a flannel collar, lace-up closure, a textured, 2 3/4" contrast wedge heel with 3/4" platform, and comfortable chunky rubber soles, you will be steady and stylish all winter long.